Felt derby available in Black and small, medium, large, or x-large. Satin Derby available in Black and small, medium, large, or x-large. Ladies Top Hat available in Black and available in small, medium, large. Felt Spoon Bonnet available in Burgundy or Gray. One size fits all. 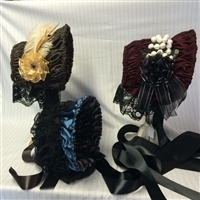 One of these attitude hats would be the perfect accessory to add a little flare to your Victorian dress. They are available in a variety of colors. Please call or email about color availability. When ordering please indicate (in order comments) which color you wanted to purchase. Top hats decorated in a variety of styles and colors to match your dress. Please call for availability. Silk drawn Bonnet available in a variety of colors and designs. One size fits all.